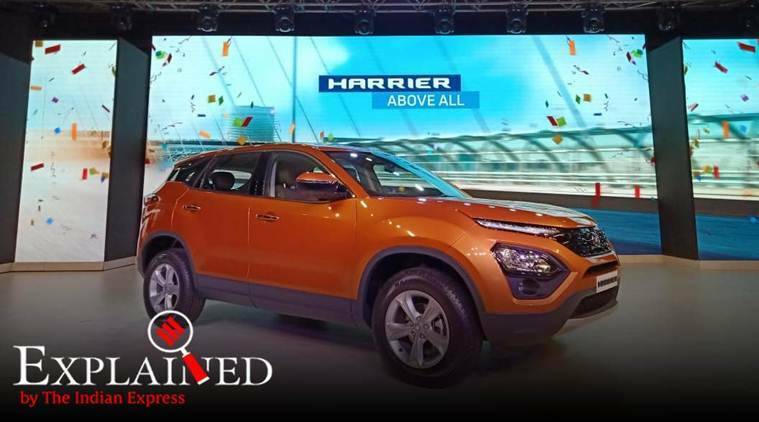 Tata Harrier SUV Launch Price in India, Features: Under its hood, the new Tata Harrier carries the same 2.0-litre turbo-diesel engine fitted in the Jeep Compass. However, it's been relaunched as Kryotec. The new Tata Harrier SUV marks the entry of Tata Motors into the premium mid-size SUV segment with a car that is a major collaborative effort – a Tata-badged car derived from Land Rover’s D8 platform, with a Fiat-sourced 2.0-litre diesel engine and a Hyundai gearbox in the automatic version. The design of the 5-seater SUV, which has been launched at an aggressive pricing of Rs 12.69 lakh to Rs 16.25 lakh across four variants, is quite similar to that of the H5X concept showcased at the 2018 Auto Expo. The car is available in four variants – Harrier XE(Rs 12.69 lakhs), mid-spec XM (Rs 13.75 lakh), XT (Rs 14.95 lakh) and the range-topping XZ (Rs 16.25 lakh). Launched in five colours — Calisto Copper, Thermisto Gold, Ariel Silver, Telesto grey and Orcus White—it is powered by a 140hp, 2.0-litre diesel engine mated to a 6-speed manual gearbox. Bookings for the vehicle, which will compete with the Jeep Compass, Hyundai Creta, Mahindra XUV, the newly-launched Nissan Kicks and the upcoming Kia SP2, have been open for the last couple of months, and deliveries are set to begin later this month. As per the company’s website, the Tata Harrier has been built on advanced 90 per cent plus automated manufacturing line for robust built quality and reliability. Other features include —monocoque construction with optimised torsional and bending stiffness for exemplary driving dynamics, efficiently designed crumple zones for absolute safety, auxiliary isolation panels for quiet and refined in-cabin experience and extensive use of advanced high strength steel and tailor welded blanks for high strength and reduced weight. What’s the design philosophy behind the Tata Harrier? The new Harrier is built around Tata’s Impact Design 2.0 at the company’s new manufacturing line at the Pune facility. It shares a lot of design features from the concept car H5X that was showcased at the 2018 Auto Expo. The SUV carries the LED daytime running lights on the top, which also work as indicators. The headlamps are quite unconventionally placed close to the bumper, which gives the SUV a unique edge. Tata Harrier SUV: The new car is built around Tata’s Impact Design 2.0 at the company’s new manufacturing line at the Pune facility. Is the Tata Harrier’s chassis based on the Land Rover’s D8 architecture? Yes, that’s right. The Harrier is built on the Omega architecture, which is derived from Land Rover’s D8 platform. Its isolated sub-frame design minimises the noise and loads caused by severe impacts such as speed humps. The company says it is their ‘testament to continue offering global products’. The new SUV is definitely the biggest vehicle in its segment: it measures 4,598 mm in length, 1,894 mm in width and 1,706 mm in height. With a wheelbase of 2,741 mm and ground clearance of 205 mm, it’s bigger than the Mahindra XUV500 (the next biggest SUV after Harrier) which measures 4,585 mm in length, 1,890 mm in width, 1,785 mm in height and has a wheelbase of 2,700 mm. How powerful is the car? Under its hood, the new Tata Harrier carries the same 2.0-litre turbo-diesel engine fitted in the Jeep Compass. However, it’s been relaunched as Kryotec. It churns out at least 140PS of max power and 350Nm of peak torque, which is paired with a 6-speed manual gearbox.